Macedonia is one of the regions in Greece and has always been an integral part of the Greek world. The original Macedonians, the Macedonian Greeks, arrived in the area around 2000 BC and they were descendants of the Heracleides (descendants of the mythical hero Heracles). The ancient Macedonians were part of a large group which reached the area around 2000 BC. Herodotus, the father of history, very carefully describes the 800-year wanderings of that large group, which eventually split into smaller groups. Amongst other clans in that large Greek group were the Dorians, the Acarnanians and Aetolians. Just after the Trojan War the first group under the leadership of Dorus inhabited Peloponnesus and the Acarnanians and Aetolians, went also south. Another group marched east and established the Kingdom of Macedonia. Europe. King Philip II was successful in uniting the Greek city-states under a Pan-Hellenic Union, which was essentially the Greek nation, as we know it today. Philip II in 337 BC and his son Alex­ander in 335 BC were chosen as the Commanding Generals of all Greeks in the Council of Corinth. The Spartans were the only ones who did not agree to participate in this Pan-Hellenic Union. 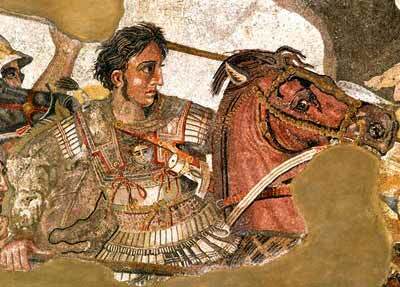 Alexander the Great, who rained from 336-323 BC, conquered most of the then known world, spreading the Greek language and traditions in the lands he conquered. The Greek Mace­donian Empire was preserved by the descendents of Alexander until 168 BC, when the Romans con­quered all the territories. Even then, however, the Greek language and culture continued to be the predominant influence in the Empire. During the Roman Conquest, which continued into the Byzantine Era – a period of about one thousand years – that territory with Constantinople as its capital and Thessaloniki as a cultural and commercial center of the Empire, kept its Greek element. Furthermore during Justinian’s time it adopted the Greek language as the normal and official language of the Byzantine State. Macedonia was invaded several times from the north from the third to the fourteenth centuries AD As a result of these invasions, the Bulgarians established themselves in 681 AD and the treaty of 716 awarded them the territory between Mt. Haemus and the River Danube. That area until that time was a province of the Byzantine Empire. A tremendous attempt to gain Hellenic territories took place at the end of the 10th century AD by the Bulgarian king Samuil. After he occupied territories reaching South Greece, Samuil’s army was chased and badly annihilated on July 29, 1014. The Serbs also grew to become a power and attempted periodic invasions since their appearance in the southern Balkans, in the ninth century. It was during this time that the Ottoman Empire was organized and by the fifteenth century, Thessaloniki (1430) and Constantinople (1453) followed the rest of the Balkans and Asia Minor by falling in the hands of the Turks. During the Turkish Occupation, Macedonia pre­served its Greek identity, in perpetuity, through Greek language, religion and culture. Greek schools were allowed to open and function in several Macedonian cities, as was the case in the rest of Greece. When the Turkish rule made this impossible, schools functioned secretly in the churches. In 1904 a systematic guerrilla effort on the part of the Macedonians with considerable ammunition and troops from the free Greeks started the Macedonian Struggle, which ended in 1908. Many glorious figures emerged from the Macedonian Struggle, among them Pavlos Melas, Germanos Karavangelis, Ion Dragoumis, Kotas, Lam­bros Koromilas, Constantine Mazarakis, Telos Agras and many others. The eventual union with free Greece saved Mace­donia from falling in the hands of the Slavs during the Balkan Wars (1912-13). The struggle against the Ottoman occupant began in 1821 in southern Greece and that part of the Greek world was finally liberated in 1832. During the Balkan Wars of 1912-13, Greece liberated its province of Macedonia, as well as other Greek regions from the Ottoman rulers. Before 1944 former Yugoslavia’s southernmost part was called Vardarska Banovina (Province -of the river- Vardar). It was in 1944 that (Joseph Broz) Marshal Tito, the principal political leader of Yugoslavia at that time, created Yugoslavia’s southern republic and called it “People’s Republic of Macedonia”. However, “Macedonia” was already the name of one of Greece’s northern provinces. After 1944 a deliberate and systematic campaign was initiated for Yugoslavia’s southern republic to take over the history of ancient Macedonia. “Scholars” from the “People’s Republic of Macedonia” were commissioned to re-write their history books to include the ancient Macedonian History according to the wishes of the League of Communists of communist Yugoslavia, accompanied by perverted maps showing their “Macedonia” going all the way down to the northern half of Mount Olympus. a “Macedonian Organization” to unite them in their newly adopted country, America, as soon as they were set up in the new land. However being alerted of the vicious and systematic propaganda emanating from their neighbors in their Macedonia’s northern boundaries, they decided to rebut the misinformation that was spreading all too fast. They were especially alarmed during the Roosevelt administration in 1944 by the “Circular Airgram” of Secretary of State, Stettinius, informing the US government officials about a “Macedonian National Consciousness”, “Macedonian Fatherland”, or “Macedonian Nation.” The USA Macedonian population suspected the aggressive intentions against Greece and decided to do something about it. They assemble all the Macedonian groups from USA and following a series of conferences and communicating with all groups concerned, a general conference was called in New York on January 21, 1947, where the first general Pan-Macedonian Provisional Committee was formed. In September of 1991 however the southern part of the broken up Yugoslavia named itself “Republic of Macedonia” and declared itself a new independent country. Greece, however, continued to object to their use of the name Macedonia. Because of this objection, the United Nations accepted this nation as a new member with the temporary name of “The Former Yugoslav Republic of Macedonia” until a permanent solution to the name is found. To this date no solution has been found and the UN deadline of September 13, 2002 has passed by with the two countries only agreeing to extend discussions on this matter. state which consists mainly of a Slavic population and various minority groups such as Albanians (30%), Roma, Turks, Bulgarians, Greeks, Serbs and others. There is no doubt that the exclusive use of the name “Macedonia,” primarily adopted by the FYROM Slavs and their promotion as “ethnic Macedonians” is a stimulus for expansionist claims by FYROM and its Diaspora. Claims to “their rights to self-identification” are unjustified and violates the rights of the Macedonian Hellenes. Under no circumstances should the international community and the international legal system allow any interference with the cultural and historic identity belonging to another nation for millennia. No one should be allowed to use a term ethnologically that belongs to another nation culturally and historically for centuries. In this case it should be perceived as an obvious attempt to appropriate everything Macedonian from us-the rightful inheritors-and extinguish our human right to our Macedonian identity. The Pan-Macedonian Association during its 65th Convention, on May 26-30, 2011 that took place in Worcester Massachusetts decided the following: “We shall never accept, for the country of The FYROM, any name that will include the term Macedonia or any of its derivatives. We urge the Greeks to investigate the pitfalls and potential damage to Greece of accepting a potential official name of The FYROM any name that includes the term Macedonia or any of its derivatives”. The Association’s Mission, as stated by its membership, is “To unite all Macedonians and all other Hellenes and Philhellenes, to protect the Hellenic origin of the name, history and culture of Macedonia, to counter falsification and distortions of our history, to promote the Hellenic ideals, history and culture and to strengthen the education and cultural ties between the United States of America and Greece”. If we were to examine various associations and benevolent societies in a global level we would find out that most of the associations originate from a need and some times a problem that people are facing at some point. The need to create the Pan-Macedonian Association of USA arose among the Macedonians of the Diaspora when they sensed that they had to protect the boundaries of their irthplace from the expansionistic view and greedy stance of their northern neighbors. The Greeks of the USA formed an organization during the 1940s to combat the propaganda towards their beloved Macedonia and the same Organization is still in full force today struggling with the same propaganda and at the same time uniting all the Greeks!